My love for Amsale goes back a decade or maybe even more. Then I was taken in by the glamorous gowns (and ads) and the romanticism they invoked. I bought a beautiful pale ivory Amsale gown for my wedding several years ago, but ended up selling it and wearing another gown. Indecisive? Yes! I still look forward to seeing the new Amsale designs every season. I am in love with the bodice detail on the gown below aptly named Juliette and was just too happy to pair it with one of our new fall designs! 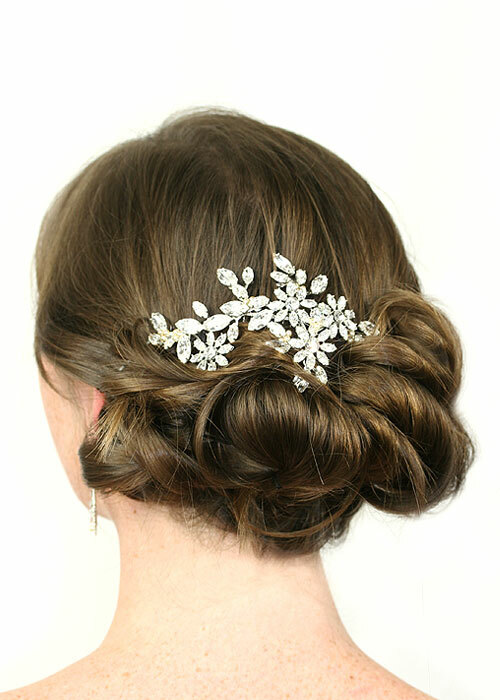 After designing the Rosaline Hair Ornament below I envisioned it paired with a flowing romantic gown like this Amsale. It’s a perfect compliment to the floral embroidered bodice detail. I almost attached this design asymmetrically to a headband…I couldn’t decide, still might. It looks very chic worn in flat in front. For me there are always too many possibilities (thus buying more than one wedding gown, three in fact)! Enjoy and as always let me know if you have any questions or comments! We had a photo shoot last Friday with the beautiful Ashley and so I am excited to show the first of the new fall line for Naugi! 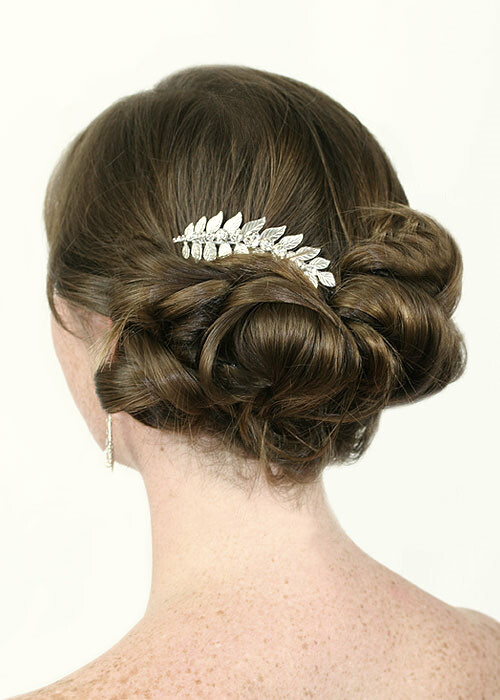 The piece featured in this romantic loosely rolled chignon is the Leaves of Grass Comb. I meant to have two of this piece on hand for the shoot because that’s how I saw it when I was designing it, as a duo of combs grouped together, but I ended up with only one and was still quite pleased. I love how the design dips into the rolls of hair in the above picture. Ashley was fun to work with and endured my poking and prodding in her hair for hours. I’ll show several pictures from the shoot this week and will start working on getting the new line up on our web site. The Leaves of Grass Comb is available now- here’s a closer look. I am so excited to be introducing a new chandelier earring Secret Love! I’ve had this new design sitting on the shelf for a few months now just waiting to be photographed on a white background. I think photography may be another post all together which I will start thinking about…let me know if you have any specific questions about photographing jewelry (not that I’m an expert, but I do have a ton of experience). 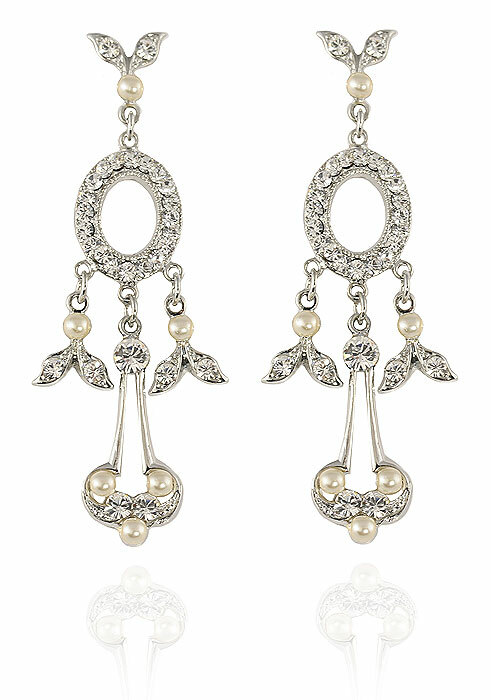 Back to the earrings…they are just beautiful with the perfect weight and swing. I’d say they are a medium length at 2 1/4″ and would serve as the perfect compliment to a gown with subtle detailing. As always please let me know if you have any questions or comments. Enjoy! I have been hard at work on a new collection featuring FEATHERS. I love the mass that this soft and billowy material can create. And… the movement that is created with each step you take is luxurious to me- a soft flutter and swoosh, swoosh as you walk. Ahhh, I just love little things like this! There are a few cool features in this collection. The two top pieces, the Sabrina Comb and the Jackie’s Feathers Comb, both can be sent back to us after the wedding for feather removal. 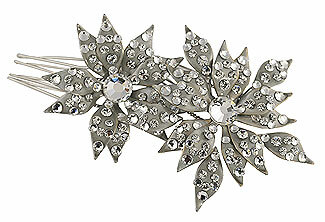 You’ll be left with a gorgeous comb to wear many times over and serve as a reminder of your special day! The 3rd piece down, the Chantilly Lace Comb has a removable brooch. Again, wear this over and over. I LOVE idea this so much! The bottom piece, the Clara Bow Headband is a lovely flapper like piece. 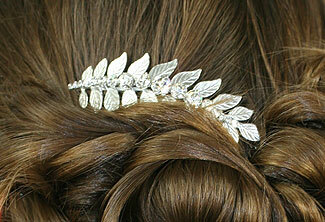 The feathers sit a few inches above the right ear for a soft and glamorous look. This detail could actually be attached to a comb if you would prefer. I love this new collection! It’s an affordable way to incorporate a larger headpiece and in a few of the designs have something left to treasure for years afterward. 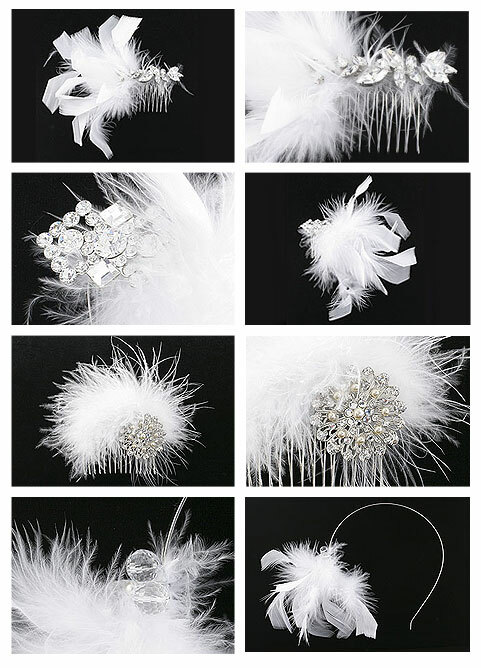 Have you thought about wearing feathers for your wedding or rehearsal dinner?